you back on Friday for another great FLASH giveaway! Happy Thanksgiving!!! Books, books and more books for my daughter. This will sure come in handy for holiday shopping. Happy holidays to all and thanks for the giveaway opportunity! Strange, I am not able to see the question asked for the comment. It says just “leave comment below”. I would use amazon gc toward a present for my grandchildren because I have to ship it directly to them. This would be WONDERFUL…I spend so much at amazon for my classroom! Happy Thanksgiving! Thanks for the chance! 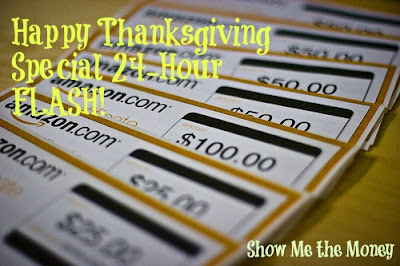 Hoping to win to have some money to use on CyberMonday!! I would like to order a crib for my son (due April 6, 2013) since my daughter (born April 19, 2012) won’t quite be a year old when our son is born so she will still be in a crib for a while too. Power by Kristie Cook!!! Then a couple of things for my nephews Christmas. I would order a Kindle Fire for my son for Christmas! !